Every now and then the world needs a little joyful anarchy. 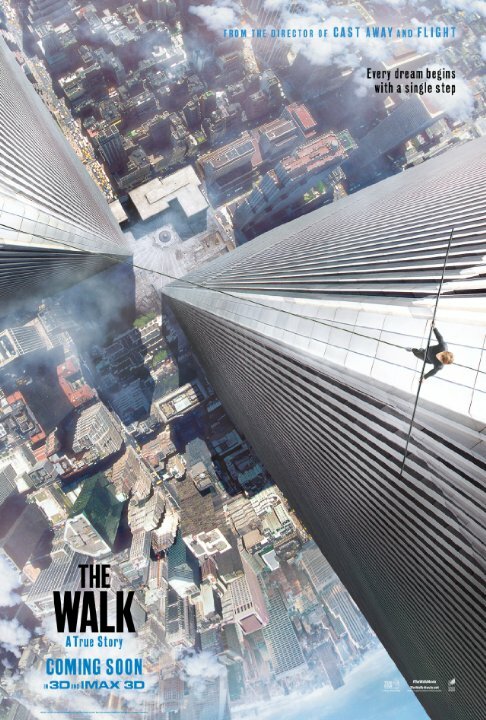 Fortunately, there are people like Philippe Petit who are willing to provide just that. THE WALK tells the story of how Petit, played by Joseph Gordon Levitt, managed to sneak into the World Trade Center shortly before it was finished and, with the help of his accomplices, string a wire between the twin towers. Once this wire was secured and as the sun was coming up, Petit walked back and forth between the towers to the shock and delight of onlookers, an amazing (and illegal) feat for which he was ultimately arrested. His sentence: performing for children in the park. There has already been an Oscar winning documentary detailing this story, 2008’s excellent MAN ON WIRE. Truth be told, when it comes to real life stories I tend to favor documentaries over dramatizations, and this is no exception. That said, what director/co-writer Robert Zemeckis has accomplished with his scripted version is to present the story in a more emotionally involving and visually spectacular way that audiences will respond to on a visceral level. The first half of the film is a bit padded, but once Petit and his crew get down to the serious business of planning and executing their “coup”, things pick up considerably. There’s a fair amount of CGI used to bring it all to life, but aside from one unconvincing seagull it’s done so unobtrusively you hardly notice. The wire walking scenes in particular feel believable, causing the audience member seated to my right to keep their eyes covered until Petit/Levitt put his feet back on the ground. I have often found Zemeckis to be a bit heavy on the schmaltz, the most egregious example being FORREST GUMP, which took a biting satirical novel and turned it into feel-good drivel. But the story of Petit’s wire walk is a feel-good story, so the classic Hollywood crowd-pleaser approach Zemeckis favors is perfectly suited to the material. It’s also a caper story, and even though we kind of know that everything works out okay from the beginning, Zemeckis still manages to generate some tension and suspense. It’s all wrapped up with a touching but classy tribute to the towers that, without saying anything explicitly about 9/11, says all that needs to be said. The result, while not without some minor issues, is one of the best mainstream Oscar-bait films to come along in a while. 3 ½ out of 4 stars.